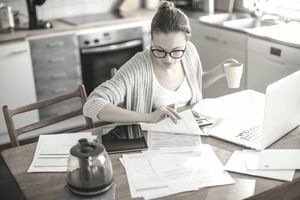 If you’re new to this freelancing game, you may feel a bit confused about the arrangements and types of work that freelancers do. If you’re a current freelancer, you may look around and feel a bit lonely in your career choice. Either way, this breakdown of the five kinds of freelancers may help to put the career into perspective. This information comes from this infographic from Line2, which also includes the somewhat surprising statistic that there are 53 million freelance workers in the United States -- one in three US workers! So if you're among them, what kind of freelancer are you? This is perhaps the most general heading, encompassing any worker who doesn’t have one specific employer. In fact, some of the following designations can potentially double under this heading, too. Example: a writer who has a contract to produce curriculum plans for an educational website, and another agreement with another entity to write one article per month for a local magazine. They may also have other similar short-term projects. This writer accrues income from several different contracts, projects and sources, and those different payments are generally the entire extent of their income. These freelancers have a steady job (perhaps a day job) and then supplement their income with other independent work on the side. Example: a teacher who works in a school all day, and then produces curriculum plans at night for an educational publisher. Her main income is from her job as a teacher, but her freelance work supplements it. These workers have a mix of income. They differ from moonlighters in that the mix is more diverse than simply a “regular” job supplemented by a contracted project. Example: Anna is a substitute teacher who works on call. She also spends three overnights a month as a caregiver at a foster home. In addition, she takes on several writing projects, specializing in writing for social justice and child care blogs. These workers have projects with a finite timeframe. The infographic notes that these workers consider themselves freelance, but have employees. This is a slightly more formal arrangement of freelancing. Example: I work as a copywriter and freelancer in Lansing, Michigan under my business name GardenWall Publications, which functions as a separate financial entity. I have two people who work for me whom I pay regularly, but I still consider myself freelance as I’m not beholden to any one employer.